When it comes to your wedding day, the more personalized materials and decorations, the better. Our brides and grooms are always striving to design weddings that tell their love story, as well as incorporate family and cultural traditions. By customizing your wedding decorations and details, you can create an event that stays true to your likes as a couple and also share a memorable occasion with your wedding guests. From custom ceremony aisle runners to trending reception decorations and wedding centerpieces featuring personalized elements, we want couples to celebrate their special day at an event that is a reflection of their pasts, presents, and futures. 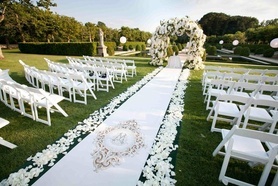 Consider embellishing the traditional white aisle runner with a your color palette, wedding monogram, or wedding date. 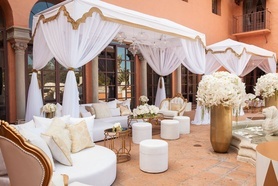 Since details and décor can make or break your wedding design, InsideWeddings.com features a list of professionals that will work hard to make your fairy-tale wedding a reality. Hosting a rustic wedding? Try a lace and burlap aisle runner handpainted with your custom monogram. Desiring a sophisticated city wedding? Try your best to shy away from traditional pieces that lack personality. At Inside Weddings, we encourage our couples to keep their celebrations timeless while always infusing their hearts, souls, and love stories into the décor. Whether you’re hosting a garden ceremony or a ballroom reception, there is always a way to infuse your personality into an event. The very best weddings are those that are made for the couple, not to match the top trends.